Ted Supalla (Neurology) teaching the MOOC, "Sign Language Structure, Learning, and Change"
Conceptualized and created by lead instructor Ted Supalla (Neurology), the GeorgetownX MOOC Sign Language Structure, Learning, and Change explores the history of sign language, how sign languages are structured, and how people learn sign languages, as well as the evolution of the language over time. It is the only course on edX that is taught bilingually in American Sign Language (ASL) and English. Supalla explains the challenges and surprising outcomes of designing a MOOC that is focused on ASL. What challenges were you trying to address with the MOOC? The linguistic structure and the historical change of American Sign Language are complex and rich. There is a range of research, including my NIH and NSF grants and related research, which are occurring in many places. The objective was to develop a sophisticated course which helps centralize and provide open access to the kind of research going on in the field. Has this challenge evolved since you began work on the course? One of biggest challenges, we realized, was related to a better understanding of our audience. There are people who do not know sign language; some of them are deaf. To deal with this challenge, we made the course accessible to both signing and non-signing individuals. This was done by offering lecture videos taught in ASL, synchronized transcripts, and voiceovers by professional interpreters. By making the MOOC accessible to non-signers, my hope is that it will expose this audience to the breadth and depth of discussions happening in ASL. How did you decide on the four topics that comprise this MOOC? In the first module, we start with disseminating basic information on the structure, processing, variation, and change in signed languages as well as the culture and literature of the signing community. With the second module, we delve into the linguistic principles of language change as shown in ASL. Some of the topics covered include derivation and inflection among signs in sentences, the role of movement and facial expressions in ASL, how knowledge of ASL grammar has been sustained throughout its history, and how the structure of the language has changed through time. The main audience of the third module is the “signing public.” There are easily over a million people in this country who fall into this target audience, which includes deaf and hearing people from signing families as well as the interpreter community. There is a tremendous need for a basic and accessible course that is sophisticated enough to introduce signers to the science of their own language. 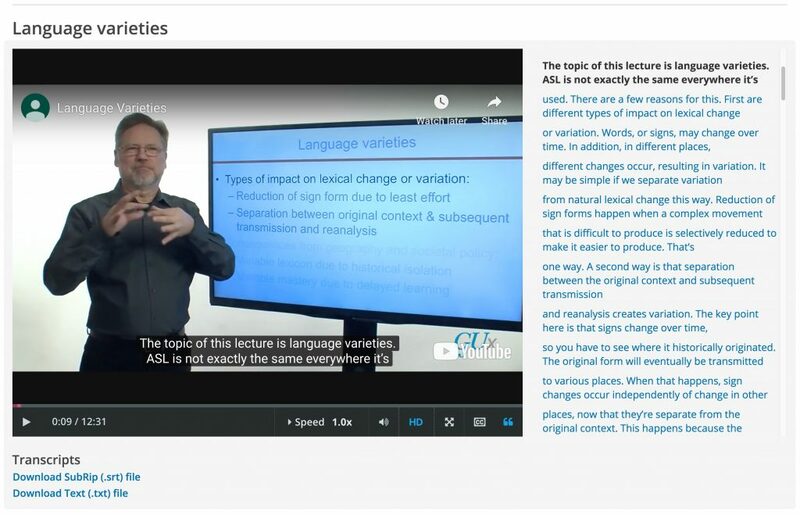 Moreover, since it is also accessible to non-signers, it exposes this audience to the breadth and depth of discussions occurring in ASL in the fields of language acquisition, neurolinguistics, and the cognitive sciences. The fourth module integrates historical approaches with language change in the contemporary field of emerging signed languages studies. An understanding of how languages are the same, how they differ, and how they come to be acts as a catalyst for understanding, giving us important insights into the nature of the human mind and brain. What considerations were at the forefront as you were designing this MOOC? Our primary consideration was the audience. Students of different ages and backgrounds will have the opportunity to directly observe and utilize cognitive and linguistic processing in the sign language medium. What significant results were achieved? At present, the MOOC is being accessed by 12,000 students from 160 countries around the world, with 1,200 students closely working their way through the first module of lectures, homework, and quizzes. While the course was live, 350 students completed the entire sequence of four modules and received verified certificates through edX for their successful completion of the course. What do you credit with some of the course’s achievements? This online course allowed me to bring my years of teaching on universal language design principles to a vastly wider audience than would be possible as part of a typical classroom course. There were also two important decisions that were crucial to the success of the course. The first was to have a team of fluent signers for video recording and editing of my lectures, which I present in sign language. The second was to have hearing CODAs (Children of Deaf Adults) as interpreters for optimal translation and synchronization for the voice-over and captioning. The media team at CNDLS worked with the interpreter during the post-production process, recording and synchronizing the audio of interpreter’s voice-over. My team is also responsible for feeding English and ASL contents for the tutorials, homework, and quizzes to the edX Studio. Were there any results you did not expect when the MOOC became live? There were a significant number of students who were not familiar with the epistemology of sign language. This meant that some students in the MOOC needed additional time to go through each module. Nevertheless, most students seemed happy and kept saying that they learned something new every day, regardless of how much time they spent on the modules. Are there key takeaways from this experience? The visual aspect of the MOOC is very significant. While hearing people can rely on both visual and auditory inputs to communicate, deaf people rely solely on visual inputs. This means that the team had to think twice not only about how information was presented, but also about the entire process of building a MOOC. For example, graphics that are usually added to the videos in the post-production process had to be present already during filming. Are there things you wish you had done differently? Why? Looking back, one thing I would have done differently is represent the MOOC as a new kind of e-book rather than course. Describing it as a book would have set expectations for students more in line with the way I was seeing the MOOC—as a resource to enjoy at one’s own pace rather than as a discussion-focused space. Furthermore, I realize how the viewing of lectures delivered in American Sign Language will enable the public to gain exposure to the rich language and intellectual capital of the American signing community. I also recognize how the modules in this course are valuable for medical school faculty and students who seek curricular support for communicating with parents of deaf children who are making plans for bilingual education, as well as for policymakers who need further information to better serve the Deaf community members and their families. So I intend to devote effort to build on the MOOC to meet this need. 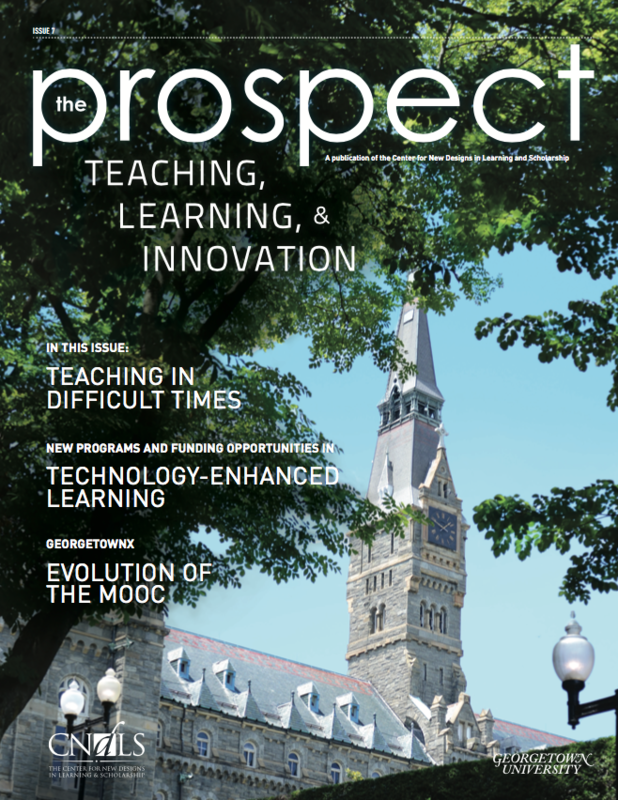 Posted February 5, 2019 by Theodore Supalla & filed under interview, MOOCs.